At Progressive Builders we love to stay on top of the latest trends in kitchen design. The kitchen is one of the most used rooms in any home. We all want our kitchen to look beautiful and inviting, while also providing a practical space to prepare meals and enjoy daily life. Painted kitchen cabinets and those with uniquely colored stains have become very popular. They add just the right splash of color in a room that is typically fairly subdued. Blue, green and black are colors to consider unless you want to stick with a more traditional gray or white look. Some homeowners are only painting certain cabinets, such as putting color just on an island or on base cabinets while leaving the rest neutral. Others like a vibrant color scheme throughout the kitchen. If you decide to try painting your cabinets yourself, know that there are risks involved. A paint job that isn’t done with a professional’s care may have a rough look. Improperly applied paint can also cause functionality problems, like doors that don’t close correctly or interference with hinges. Basic Shaker cabinets may never go out of style. They have that right blend of traditional and modern looks without going too far one way or the other. We’re seeing a lot of people remodel with Shaker kitchen cabinets. A lot of homeowners are remodeling kitchens to have a more open feel. Natural lighting is a big part of the open concept approach. This may involve installing larger picture windows, skylights, or solar tubes. Sometimes a dividing wall can be knocked down to bring in more natural light from neighboring rooms. Granite and other natural stones will always be popular, but we’re seeing more people gravitate toward marbled quartz countertops. Quartz is an engineered product composed of quartz mineral, resins, pigments and polymers blended to create a consistent, marbled look. Even though quartz is artificial, it has a natural appearance and is extremely durable. The importance of technology in our daily lives is being reflected in more and more kitchen designs. Smart appliances that can do amazing things. Some homeowners are still leery about smart fridges and super high-tech appliances that can be intimidating and confusing. However, there are other ways to incorporate technology into kitchens. This may include installing USB connector ports for convenient charging, built-in wireless speakers, smart lighting, voice-controlled TVs and digital assistants. In contrast to the trend toward colorful cabinets, another popular kitchen design trend is open shelving. Eliminating cabinets in favor of open shelves puts all the ingredients, supplies and knick-knacks out on display. 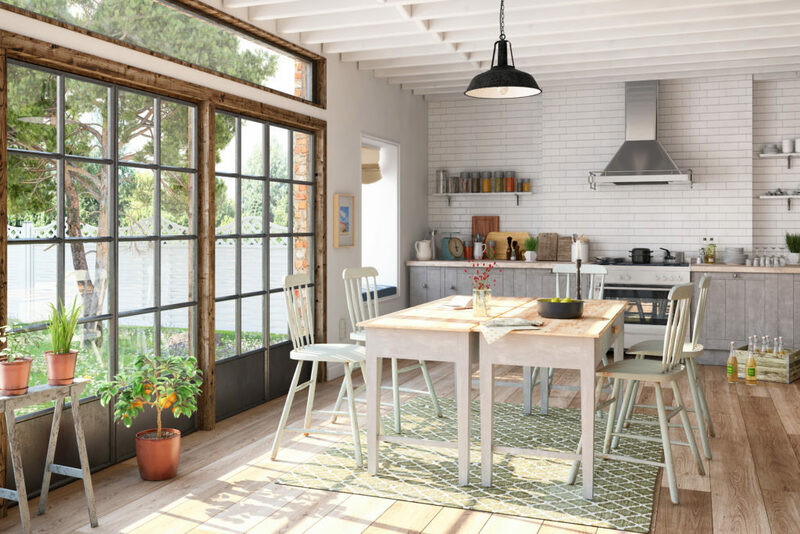 Check out our recent Progressive Builders blog article for more tips on how to remodel to an open shelving kitchen design. These are just a few of today’s most popular kitchen design trends. For more tips and information about how you can remodel your kitchen, contact Progressive Builders today or visit our website.